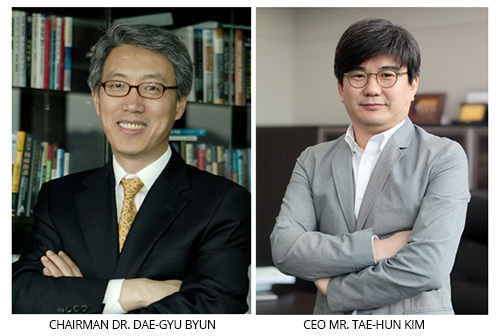 (Dec. 1st 2014)… HUMAX has named COO, Tae-Hun Kim as new CEO, succeeding Dr. Dae-Gyu Byun from 1st of December 2014. It has been 7 years since Dr. Dae-Gyu Byun started considering appointing a new CEO in 2007 and from last February for 10 months, Mr. Kim was appointed as an incoming CEO and prepared to take over the position. Mr. Kim will lead the future of HUMAX that has had a great influence in Korea’s venture business history. Established in 1989, HUMAX targeted the global market from the beginning as a rare and extraordinary case for a venture company and now selects new CEO for the first time in their 25 years of company history. “The ability to lead the present and the future development, sustainability as well as employees of the company was the first priority in selecting new CEO. I think Mr. Kim is a perfect person to lead HUMAX in this turbulent time as the broadcasting industry is challenged in many ways such as convergence of broadcasting and communications and expanding IP services,” said Dr. Dae-Gyu Byun. Dr. Byun, who led the company for 21 years as a founder, achieved the sales record over 1 billion dollars in 2010 and established HUMAX as a leading company in the global Set-top box industry, is now the Chairman of the Board of HUMAX and will focus on long-term business strategy planning and risk management. Furthermore, he will play a broader role as CEO of HUMAX Holdings, establish a sound and responsible management system through finding new business opportunities, setting up mid to long-term strategies for subsidiary companies of the HUMAX group, discovering and developing talented personnel and sharing core values. The incoming CEO joined the company in 1993, while he was still studying in the university. HUMAX was only a small venture company with sales revenue of 4 million dollars at that time. For the past 21 years, he has experienced and led many roles in development, sales, overseas office, marketing and business planning and operation fields. Especially, he made DirecTV, the biggest satellite broadcasting operator, as a client of HUMAX while his time in the U.S office, which is a great contribution to make the company become a mid-sized corporation with its revenue more than 1 billion dollars. “There have been many changes in HUMAX to grow from a small venture to a mid-sized company and I was very lucky enough to learn positive lessons from many people including our chairman Dr. Byun, my colleagues, clients, partners and competitors while we were passing through these great changes. When I look back on the past years, our strong teamwork was the key to overcome these challenges and took them as opportunities. So my goal would be encouraging our employees to perform their abilities and put them in perfect harmony to create further development in the company,” addressed the new CEO Mr. Tae-Hun Kim in his inaugural message. “It has been more than 25 years since HUMAX was established. There have been difficult times and challenges but we have tried our best to find the right direction and better solutions to make a sound and sustainable organization. I have no doubt that we have accomplished remarkable business achievement. Our business performance, large clientele, various experiences, diversified corporate culture, infrastructure and management system across the world are the most valuable assets that even large corporations have to learn it from experiences for long time. I believe these values will show its values as time goes by,” said the Chairman Dr. Byun in a message to HUMAX members. As the first generation venture company, HUMAX has continued on its growth with persistent innovation and challenge. Through the shift in corporate governance of separating the chairman of the board and CEO, HUMAX has now established an ideal decision-making process and responsible corporate management system.